I walk into a matted room on a Wednesday evening inside the Intramural Activities Building, a fitness facility for the University of Washington student body. Inside are a couple dozen student-fighters strapped with headgear and handwraps moving in circular unison to train their footwork. 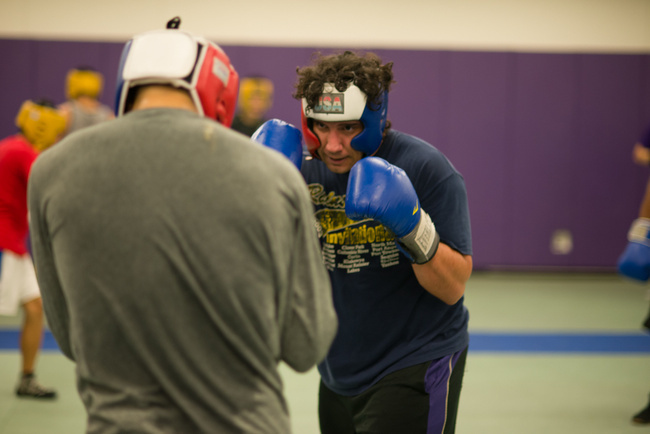 They are the University of Washington Boxing Team, a squad of fighters that formed five years ago and is the Northwest’s bid to bring boxing back to its collegiate heyday. College boxing was once followed as closely as its professional counterparts, much like how NCAA basketball and football have held a committed following outside of the NFL and the NBA. The famed example goes back to March 29th, 1940, where Joe Louis defended his heavyweight crown against Johnny Paycheck in front of a crowd of 11,620. On that same night, over 15,000 spectators tuned in to watch the pugilists of Washington State face off against the University of Wisconsin, proving that collegiate boxing viewership operated on an even, if not greater, level as the professional ranks. The sport enjoyed a firm following until 1960 when Charlie Mohr of the legendary University of Wisconsin squad died in the hospital after suffering a KO loss. Though studies have suggested his death to be caused by unrelated pre-boxing conditions, a ban was put on nonetheless. 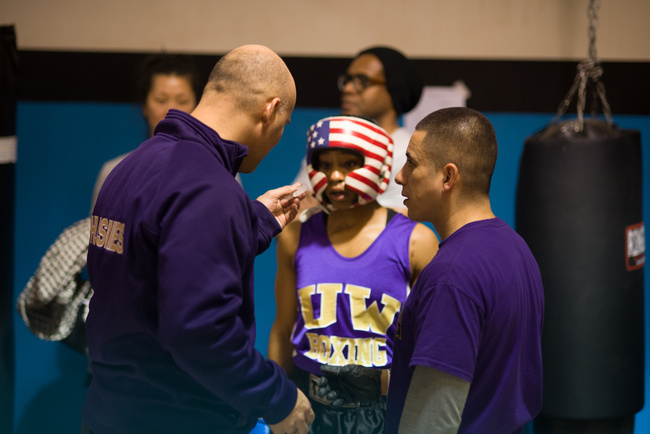 Head coach Chris Mendez and coach Ricardo Acuna prep Taylor Williams for her first bout in the regional Golden Gloves tournament in Tacoma, WA. Sixteen years later years, boxing reemerged onto the college landscape, though nowhere near its former heights of notoriety, as today most of the public is not even aware that boxing continues to be a collegiate sport. Part of that is due to the general decline of the sport. The other is because it is no longer sanctioned under the traditionally recognized NCAA and instead operates under the sport specific banner of the National College Boxing Association (NCBA) and later the United States Intercollegiate Boxing Association (USBIA) in 2012. 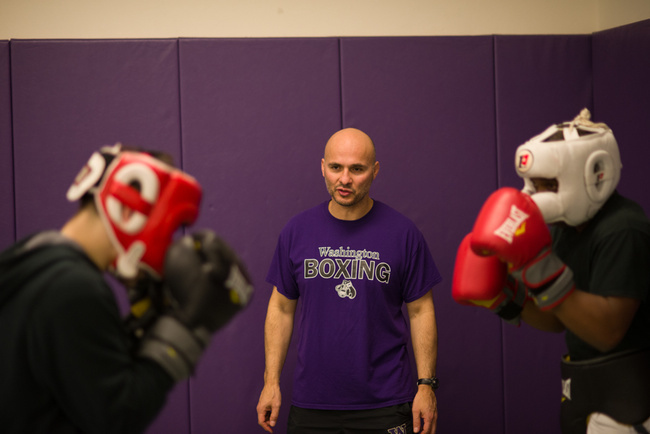 Between the two the organizations, almost 80 universities have reinstated boxing into their athletic curriculum, and about five years ago, the University of Washington joined what seems to be a growing list of competing universities. Coach Ricardo Acuna takes a moment to observe the tournament after finishing warm-up drills with his fighter before their bout. 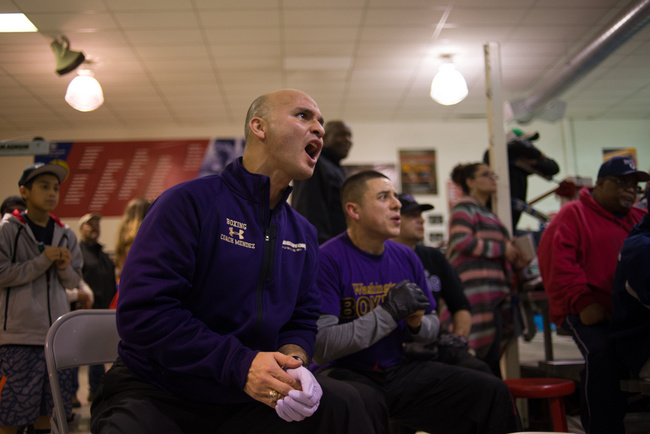 Mendez and the other coaches are not paid for their time; in fact, the trainers will often dip into their own pockets to fund a team’s sojourn to a national tournament. Aside from the $500 stipend provided by the university each year, the rest is reliant on donations from alumni and fundraising efforts from the boxers themselves. Their current campaign is a venture selling beanies, sweatshirts, and t-shirts embossed with the team’s logo. 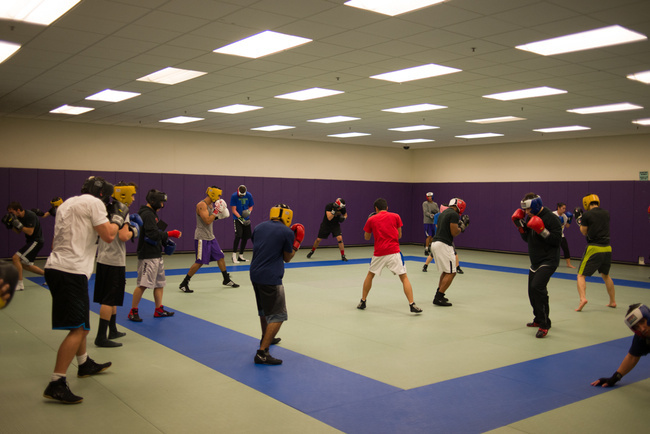 The University of Washington boxing team warming up before their training session. The team currently trains in a fairly spacious mat room. If the focus was Judo or jiu jitsu, the space would be perfect, but with boxing being a striking sport, they are severely underequipped. There are no heavy-bags, speed-bags, double-end-bags, or any sort of bag that one would normally find inside a traditional boxing gym. Instead, much of the session involves multiple rounds of self-guided shadowboxing and partnered punching drills where the coaches drift in between giving feedback on technique. Some of the more experienced fighters break off and go into separate corners to spar, a practice that wasn’t always welcomed on university property. Coach Ricard Acuna wearing one of the club’s T-shirts. Shirts were one of various clothing items produced and sold as a fundraising campaign brainstormed and led by the team. 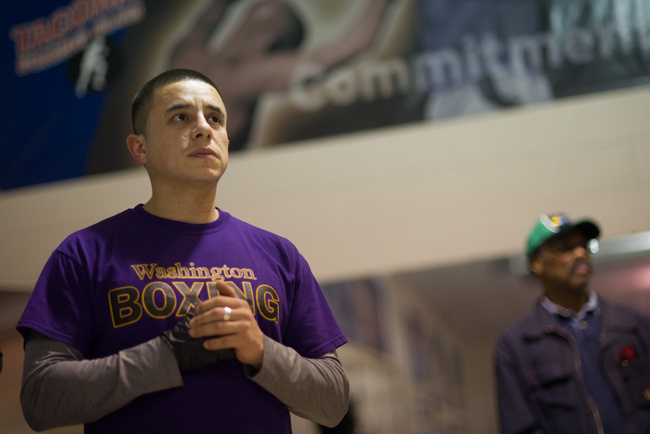 Safety concerns prevented the first generation of Washington fighters from sparring, and continues to be one of the biggest roadblocks to having a college sign on with the NCBA. While sports like football have been statistically proven to cause more long-term physical damage upon its participants, it is perhaps boxing’s objective of hurting an opponent that sits uneasy with college administration. In order to curb safety concerns, the NCBA has taken measures to make the sport safer for its competitors. At NCBA sanctioned bouts, fighters switch out 10oz gloves for 12oz, and rounds go for two minutes instead of the traditional three. Seldom does a college boxer plan to fight after graduation, so the amateur experience is treated more as the final destination rather than a grueling step in preparing for the harsh realities of the professional world. Mendez applies that mentality to the training sessions as well. The University of Washington boxing team huddles together before their fighter’s bout where they give prayers and motivational cheers before their fighter makes their ring walk; a ritual performed each time one of their fighters enters the ring. 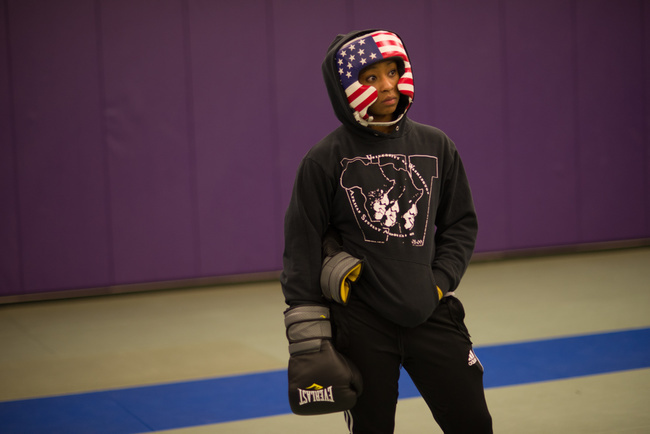 After a grueling process of protocol and paperwork, and with Mendez now at the helms, the team eventually earned its right to spar on the campus facility as well as the right to compete in bouts using the university banner. 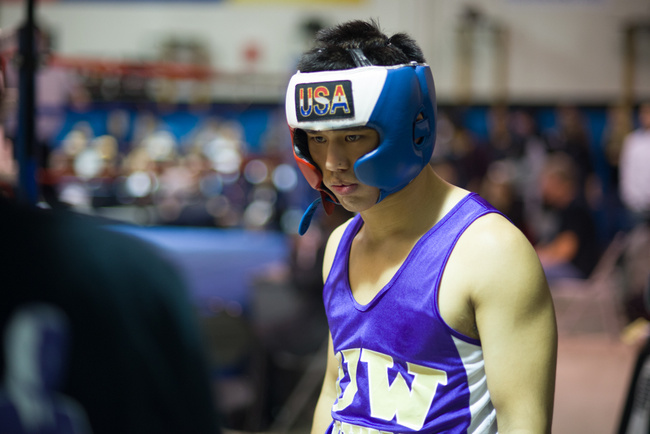 Because participants are covered under the umbrella of USA Boxing, college boxers are therefore allowed to compete in all amateur bouts, even those outside of the tourneys specifically sanctioned for collegiate fighters. 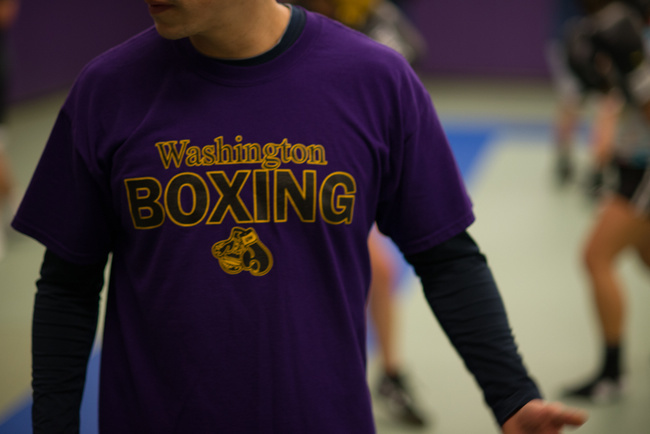 And despite the lack of proper training equipment, the UW Team has fared pretty well for themselves, boasting three champions in the women’s division of the 2014 NCBA Championships, and most recently taking away four titles at the regional Golden Gloves tournament, only two shy of the tournament’s habitual favorite, The Tacoma Boxing Club. Light heavyweight contender Richard van Siclen fighting in the Golden Gloves tournament in Tacoma, WA. Team captain Albert Ta waiting to enter the ring. A bell rings and signals the end of what appears to be a preliminary warm-up period. Fighters take a knee and congregate around the front as Mendez proceeds to make announcements on logistical training updates and results from recent matches. He then goes around and has the competing fighter stand up and publicly assess his or her performance to the team, stating things done well and things that could be improved. The idea is to proliferate advice to their teammates for their own bouts in the future. There is a stern sense of discipline and respect in the ritual; all eyes and ears are glued onto the speaker like a congregation to a Sunday pulpit. Not all announcements are fight related. Mendez corrals a round of applause for one student’s acceptance to a graduate program at Stanford and later pulls out a spreadsheet to go over the financial progress of the fundraising campaigns. Considering all the time, money and effort spent on tournament travel, fundraising calculations and student check-ins, it all seems like a lot to manage for someone to do without pay. Mendez and Acuna observing ringside during one of their fighter’s bouts. Team president Bryan Houghton listening during the team announcements. One person fitting the profile is Bryan Houghton, a 3rd year finance major who campaigns in the super heavyweight division. He carries a jovial attitude and speaks with a noticeable respect towards others, a byproduct from his time spent training with the Navy. With Mendez implementing much of his own vast military background into the program (he was a pugilist for Army and an Army Ranger), the structure of the team appears to fit Houghton nicely. Team president Bryan Houghton in a sparring session against a teammate. Houghton is the team’s president, a role responsible for communicating with the two team captains, or as Mendez describes them in military metaphor as the “platoon leader and platoon sergeant.” Houghton’s title of president is one of four administrative positions considered as “squad leaders” that are held accountable for up to ten fighters, and responsible for tracking academic performance, attendance to both class and training, and other miscellaneous measures, such as output in their latest fundraising efforts. Mendez winds down the announcements by officially declaring the team “in the black” on their beanie fundraising venture and congratulates the team with the most sales. Houghton raises his hand to ask if Mendez has taken into consideration the ratio of students to sales in calculating the results. With his team coming in last place, Houghton explains that he’s at a handicap with only seven members on his team instead of the standard ten. Mendez tells him he hasn’t and won’t consider it into the final tally, but gives Houghton a kind laugh for his competitive spirit. Head coach Chris Mendez observes two fighters during a sparring session. Because of underfunding, the team does not have a traditional boxing ring to conduct sparring, and instead pair off in the corners of the room while being observed by coaching staff. From grade point averages to overall attitude, student-fighters are held up against a variety of measures to ensure their spot on the team. 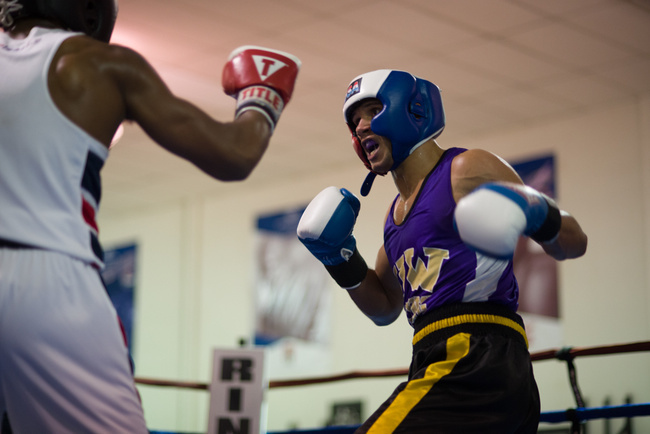 Maintaining good grades is a common practice found in many boxing gyms, though in the college arena, the practice is perhaps a bit more pronounced. The current average of the team is a 3.2, aiming for a 3.4 by the next quarter, and while fighters not meeting academic requirements are given second chances, being dropped from the team for underperforming scholastically is an imminent possibility. It’s clear that the objective of the team is not solely focused on athletic development. It is often thought that scholarly intelligence and fighting cannot coexist, that those who choose to compete in a sport designed to punch another human being are senseless brutes. 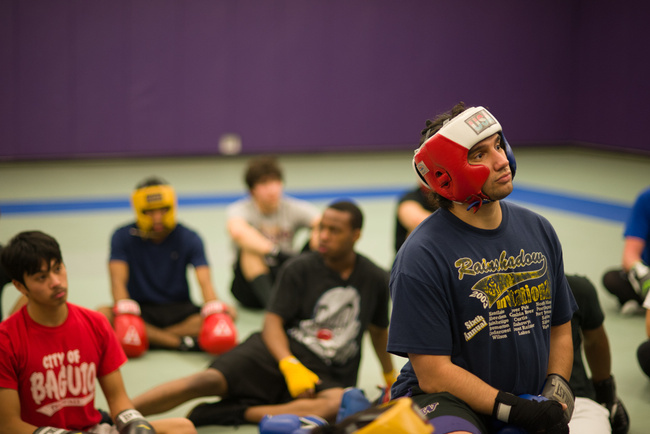 But given performance of the UW boxing team both inside and outside the ring, they are defying that stereotype and creating responsible citizens in the process. Essentially, they are making a strong case that the term “fighting scholar” is no longer considered an oxymoron. Support the team by donating here.